Maccaroni Osteria Italiana has generated a bit of a buzz on a couple of social media vegan dining groups recently. I was first alerted to it when a friend went there a month or so ago and our vegan dining group immediately resolved to eat there as soon as we could organise it. There were 15 of us and we asked to have the banquet which was $40. For $40 the food we got was astonishing in value and flavour. This was terrific food, sometimes homestyle sometimes beautifully presented, and all so generous. In quality, it was well above an average local cafe, but still priced like one. I think it will become a regular favourite. My only complaint is that I was so full that I couldn’t move afterwards. The fact that I managed to taste everything when I was really full is a testament to how delicious it all was. My mouth could happily have kept going, but my stomach was unwilling. The restaurant has an extensive vegan menu as well as a non vegan one, so it would be a good place to dine with non vegan friends or family. Frankly they wouldn’t be disappointed if they dined from the vegan menu. There are also several marked vegan wines on the menu. The service is friendly and helpful. But enough raving about how good it was, here is what we ate. We started with bruschetta made from homemade toasted bread served with two sauces, a Kalamata olive tapenade and a delicious sun-dried tomato puree. Also in this course was a platter of misto fritto consisting of small arancini, crumbed ascolane olives, panelle (chickpea fritters) and potato croquettes. All delicious. Last of the entrees was macco di lenticchie – a lentil and vegetable soup served with croutons. It was smooth and very flavourful, it impressed both soup lovers and haters alike. First up was a dish named Pita Panormus. This turned out to be a baked potato pie with Palermo onion sauce and black olives. It was delicious comfort food and unfortunately I went back for seconds. This would later turn out to be a mistake as there was so much food still to come. The Pappardelle Funghi e Tartufo – fresh pappardelle pasta with mushrooms and truffle creamy sauce was probably my favourite dish of the night. Definitely swoonworthy and hard not to lick the plate. Next up was Gnocchi Forest – potato gnocchi with vegan Bolognese sauce and mushroom. I loved the gnocchi. They were light and pillowy, but I was not so fond of the sauce as some others. It was good, just not my favourite. Fagottino di melanzane con cuore di pasta – Tagliatelle with Sorrentina tomato sauce wrapped in fried eggplant with basil. This dish was both beautiful and delicious. I am scared of undercooked eggplant, but this was impeccably done, with silky soft insides and crispy skin. Teamed with perfectly cooked fresh pasta I could have eaten a full plate of this…if only I hadn’t been so full. As it was I did go back for a second serve. The baked lasagna with bolognese was popular, but it was probably my least favourite dish. It was good, but I just couldn’t do it justice when I was so full that I was barely able to move. Luckily for me I’d worn loose pants. The last main was a vegan scaloppine with mixed wild mushroom served with potatoes. Again this was excellent. The scaloppine was great with a perfect texture. The sauce was also good, but a bit similar to the pappardelle. For variety I’d have preferred something different. We heaved a collective sigh of relief at the end of the mains and prepared ourselves. 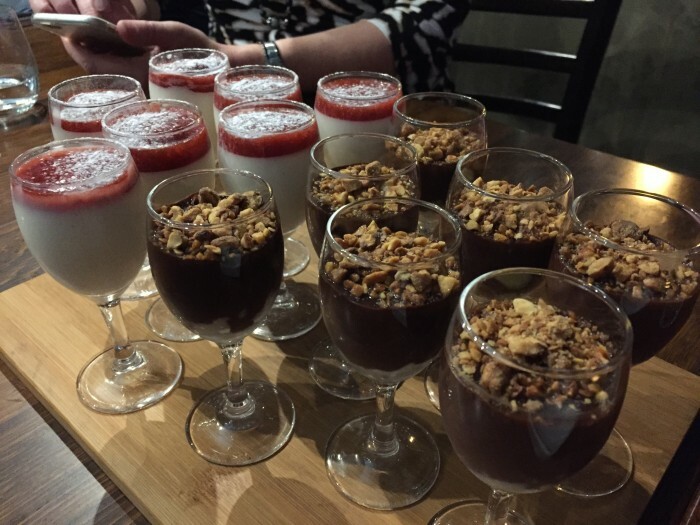 Last up were our desserts – a chocolate and almond mousse with Frangelico and crunchy nuts and a vegan pannacotta with a mixed berry coulis. Mercifully the desserts came in small glasses that held just a few mouthfuls. This was a perfect amount, anything more and I’d have been defeated. Both were delicious, but the star for me was the panna cotta. There is no doubt I will be back, I’ve already spoken with my sister about organising our next family dinner here. But I will eat less next time. At least I hope so! I really underestimated the lentil soup until I tasted it – what a knockout!